Keswick is the perfect place to stay for exploring the Lake District. Here's a handy guide of useful links to help you plan. 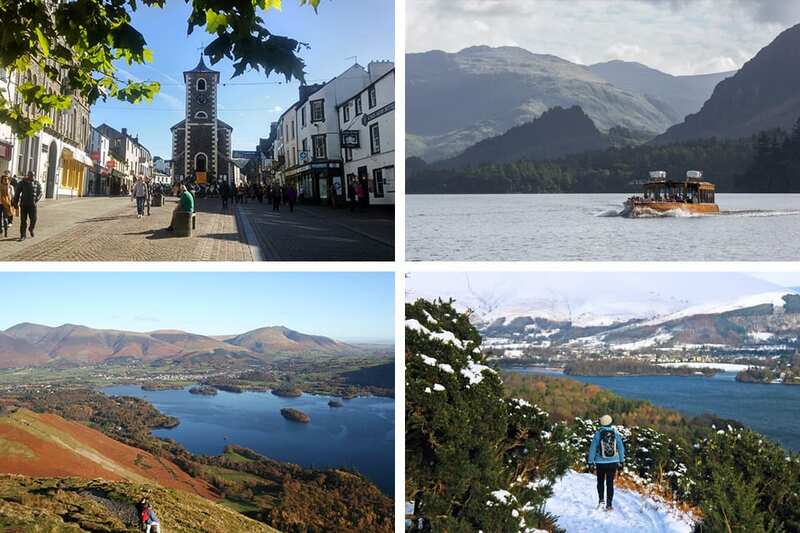 Clockwise from top left: (1) Moot Hall in Keswick town centre, (2) Keswick Launch on Derwentwater, (3) Winter walking with views towards Latrigg and Skiddaw (4) View of Keswick from the top of Catbells. Keswick, a small market town in the Northern Lake District which is encircled by the grandeur of the high fells and lying on the shores of picturesque Derwentwater. An idyllic location not only for all season walking, climbing, sailing, mountain biking, fell running and cycling but also provides a wealth of low level paths and less arduous fells for those who want to take things easier. See reviews and photos of Keswick tourist attractions. A directory of places to eat in Keswick from Keswick Tourism. See reviews for the best dining in Keswick, Lake District. Keswick Tourism’s guide to events and festivals in Keswick. Golakes guide to what’s on in Eden Valley. The official tourism website for Keswick in The Lake District. The official website for The Lake District, Cumbria. The Lake District weather is an unpredictable mistress. See what the BBC predict. Keswick weather direct from the Met Office. Local forecast for the Lake District National Park. Up to date travel info on road works, closures etc. See our guide to the best events and festivals in Keswick throughout the year.